Twelve extraordinary tales of crime and punishment. A court is a chamber of questions. Who, when, why, what happened and exactly how - these are issues of psychology and the soul, they're general to the human condition, with its infinite capacity to cause pain. ... these and other extraordinary cases become more than just courtroom dramas and sensational headlines. They become a window onto another world - the one where things go badly wrong, where once invisible lives become horrifyingly visible, where the strangeness just beneath the surface is revealed. Braunias is a columnist and journalist and has written numerous non-fiction books on a wide range of topics. 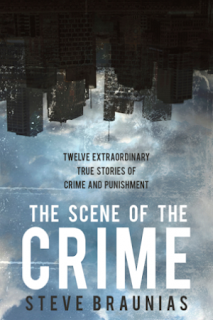 The cases he writes about in THE SCENE OF THE CRIME are mostly New Zealand cases and mostly those that New Zealand readers will remember – Mark Lundy, Antonie Dixon, Clint Rickards. Braunias’ concerns with the Mark Lundy trial and re-trial thread through the book, and make for compelling and disturbing reading. I daresay many readers will have opinions on the guilt or otherwise of the accused, and many, like me, will have been swayed when forming those opinions by body language or thoughts of how people ‘should’ behave. Braunias exposes this as common, shallow, and potentially damaging. Braunias’ writing draws mainly from the courtroom – as he sits and witnesses the “sheer ordinariness” of New Zealand criminal court proceedings – but it is also based on his research, and interviews with various parties to the different cases. It is an impartial telling but also very human: he sympathises, he criticises, he worries. THE SCENE OF THE CRIME is amusing at times but is a serious book, it is a book about how society deals with crime, how it attempts to tidy away the messiness of events into an understandable narrative, so people can feel safe and gain that figment: Closure. Braunias reminds us that the stories we choose are not just cautionary tales, not works to make a moral point, but stories that conceal real people, people who continue to grieve, to serve their sentences, to walk free ... An exceptionally good read.